Casa de Ruiz, which literally translates to "the house of Ruiz", has a long and distinctive history. Unfortunately much of this history has been lost with the passage of time and that which remains is at best uncertain. The house was built during the founding of Albuquerque sometime after 1706. This would make Casa de Ruiz the oldest residence in Albuquerque and one of the oldest structures in the state of New Mexico. The property was originally a residence built by the Ruiz family in the early 1700's. It remained a residence until the last inhabitant, Rufina G. Ruiz died in 1991 at the age of 91. The house had never been sold and had remained in the Ruiz family since the early 18th century. The family can be traced back to Julianna Lucero and Francisco Ruiz both born around 1834. No record of their ancestors has been found but it is quite possible the dwelling was several generations old by this time. Their daughter Sarah Ruiz, born on February 22, 1880, was Rufina's mother. We are open everyday from 8 AM until 9 PM, except for Sundays in which we are open from 8 AM until 4 PM. 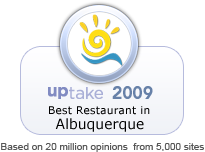 If you would like to make reservations for 6 or more please call us at (505) 247-8522. Remember to try our salsa! Our HOT Salsa won 1st Place and our MEDIUM Salsa won 3rd place at the 2010 Fiery Food Scovie Awards!